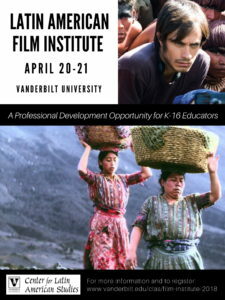 Description: Educators came to Vanderbilt to join CLAS for this one and a half-day film institute to view and explore two critically-acclaimed films: Even the Rain and Ixcanul. Professor Earl Fitz (Vanderbilt Spanish and Portuguese Department) and educator Claire Gonzalez (Harpeth Hall School Spanish) led participants in reflective discussions, and educator Caroline Miller (Glencliff High School ESL and Cinema Studies) shared strategies for using film in the classroom. Related resources were shared and time was given for collaborative curriculum development. Each workshop participant received a DVD of their choice of the two films and a certificate for 10 hours of professional development. Registration: Register by Sunday, April 15. Fee ($15) includes on-campus parking both days, coffee/light breakfast both mornings, and lunch on Friday, as well as one film on DVD. Registration is free for pre-service/student teachers. Contact Colleen McCoy [colleen.e.mccoy@vanderbilt.edu] for more information. Travel scholarships available.